First and second prizes of the nineteenth annual Uel Wade Music Scholarship competition were awarded to violinist Hannah Cohen of Lee, MA and pianist Paul Çelebi of Pittsfield. Tied for third were Zoe Ronen, trumpet (Copake, NY) and Taylor Fohrhaltz-Burbank, viola (Richmond, MA). 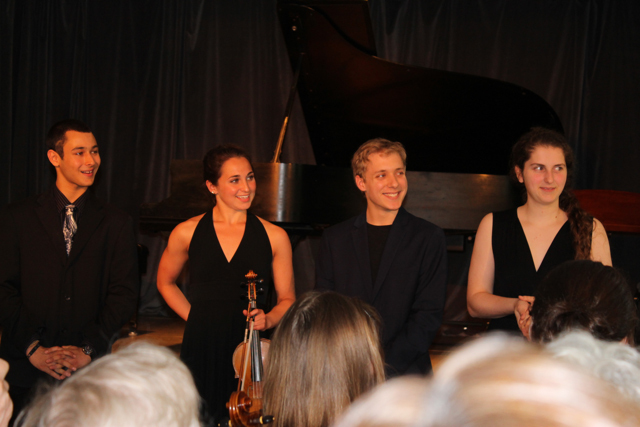 They each presented approximately fifteen minutes of repertoire during a public concert at the Spencertown Academy on May 18, 2014 and were evaluated by a panel of four professional musicians: Peter Bellino, trumpet; Michael Emery, violin; Lincoln Mayorga, piano; and Richard Mickey, cello. Thanks to community donations, the Uel Wade awards (among the most generous music awards in the country) gave these local teenagers something to add to their very expensive music endeavors: $4,000 to Cohen; $3,000 to Çelebi; and $1,000 each to Ronen and Fohrhaltz-Burbank. During the judging process, last year’s first-prize winner, pianist YeeJin Yuk, performed. Because YeeJin was only sixteen years old when he won in 2013, he will be eligible to compete again in 2015. The Uel Wade Scholarship is open to teenage musicians from four local counties: Columbia, Greene, and Rensselaer in NY and Berkshire in MA. There is no entry fee. For details, consult site: www.ulewade.org.